Three archers stand poised in an outdoor setting, 1860 – ca. 1900. The men are practitioners of Kyudo, Japanese Zen archery. Their outfits and the way they hold their second arrows (Ya) between their fourth and fifth fingers give this away. The target is most likely 28m away from the men, since they are shooting outdoors at what appears to be a makeshift range. Traditionally, 28m outdoor shooting is the final and most advanced stage of training in Kyudo. Beginners practice indoors (sometimes outdoors) on a target only 2m away. Practicing with such a close target ensures you cannot miss, so you can work on refining your shooting technique. Traditional Kyudo is not about marksmanship at all, but rather about the act of shooting itself. The Ya (arrows) are traditionally made with feathers from each wing of a single bird. One Ya has the right wing’s feathers, the other has the left wing’s. This causes one arrow to spiral to the right and the other to spiral to the left as they are shot from the Yumi (bow). The men are wearing the traditional Kyudo outfit consisting of a Kimono (upper body) and Hakama (lower body). A small ritual is performed prior to practice in which one sleeve of the Kimono is taken off to minimize shot interference. Additionally, some schools of Kyudo use the knot of the Hakama to balance the second Ya while the first one is shot. It looks like these Ya are very short, which explains why they are holding them in their fingers. Only one of the men is wearing the traditional deerskin hand covering on his right hand (Ya hand), suggesting that these men did not have much (if any) money to spend on their art. The hand covering is essentially a (usually) 3-4 fingered glove that allows the Kyudoka (practitioner) to comfortably hold the drawn Yumi and Ya in place. Typically, a Kyudoka will keep his Yumi drawn for 15-30 seconds. The Ya is released “when the time ripens”, or whenever it feels right to release it once you’ve become comfortable with the drawn Yumi. 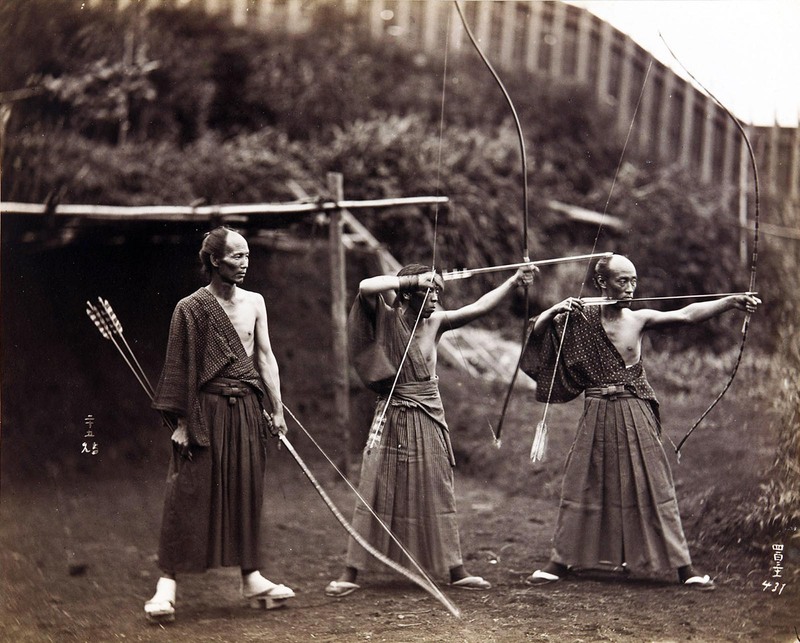 Kyudo is an extremely slow martial art, designed to allow for meditation while practicing. Everything is done deliberately, and no energy is to be wasted in the movements leading up to a shot. People seeing Kyudo for the first time will often think it looks lazy or very easy for this reason. Kyudo is all about technique and minimizing effort to achieve the shot. The bows can have very high draw weights, but the actual drawing of the bow is done in single motion from above the head in a push-pull fashion. There is no one drawing arm. The arm holding the Yumi (bow) pushes it forward as the arm stabilizing the Ya (arrow) draws the string back. Since it is drawn from above the head, the body acts as a fulcrum for both arms to draw. For this reason, with perfect technique, even a seemingly frail practitioner of Kyudo can draw a Yumi of great draw strength with ease. (Photo credit: Freer Gallery of Art and Arthur M. Sackler Gallery Archives).